The recent meteor explosion over Chelyabinsk brought to the forefront a topic that has worried astronomers for years, namely that an impactor from space could cause widespread human fatalities. Indeed, the thousand+ injured recently in Russia was a wake-up call. Should humanity be worried about impactors? “Hell yes!” replied astronomer Neil deGrasse Tyson to CNN’s F. Zakharia . The geological and biological records attest to the fact that some impactors have played a major role in altering the evolution of life on Earth, particularly when the underlying terrestrial material at the impact site contains large amounts of carbonates and sulphates. 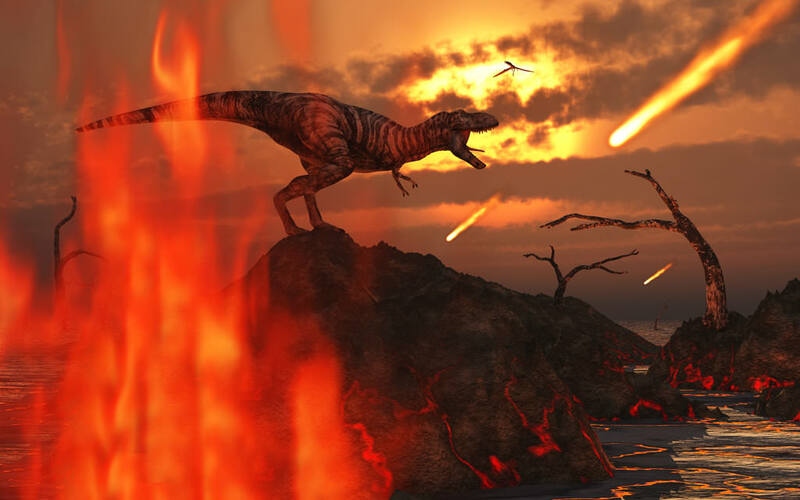 The dating of certain large impact craters (50 km and greater) found on Earth have matched events such as the extinction of the Dinosaurs (Hildebrand 1993, however see also G. Keller’s alternative hypothesis). Ironically, one could argue that humanity owes its emergence in part to the impactor that killed the Dinosaurs. More than a dozen known impactors created 50 km sized craters (and larger) on Earth. One such example is the Manicouagan crater in Quebec, Canada. The crater is 215 million years old, and exhibits an 85 km diameter (image credit: NASA). Only rather recently did scientists begin to widely acknowledge that sizable impactors from space strike Earth. “It was extremely important in that first intellectual step to recognize that, yes, indeed, very large objects do fall out of the sky and make holes in the ground,” said Eugene Shoemaker. Shoemaker was a co-discoverer of Shoemaker-Levy 9, which was a fragmented comet that hit Jupiter in 1994 (see video below). Beyond the asteroid that struck Mexico 65 million years ago and helped end the reign of the dinosaurs, there are numerous lesser-known terrestrial impactors that also appear destructive given their size. For example, at least three sizable impactors struck Earth ~35 million years ago, one of which left a 90 km crater in Siberia (Popigai). At least two large impactors occurred near the Jurassic-Cretaceous boundary (Morokweng and Mjolnir), and the latter may have been the catalyst for a tsunami that dwarfed the recent event in Japan (see also the simulation for the tsunami generated by the Chicxulub impactor below). However, in the CNN interview Neil deGrasse Tyson remarked that we’ll presumably identify the larger impactors ahead of time, giving humanity the opportunity to enact a plan to (hopefully) deal with the matter. Yet he added that often we’re unable to identify smaller objects in advance, and that is problematic. The meteor that exploded over the Urals a few weeks ago is an example. 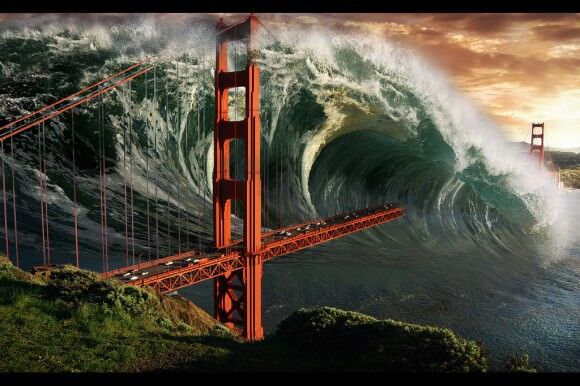 An artist’s sketch of a tsunami which can be potentially generated by an asteroid/comet impactor (image credit: binouse49/deviantart). In recent human history the Tunguska event, and the asteroid that recently exploded over Chelyabinsk, are reminders of the havoc that even smaller-sized objects can cause. The Tunguska event is presumed to be a meteor that exploded in 1908 over a remote forested area in Siberia, and was sufficiently powerful to topple millions of trees (see image below). Had the event occurred over a city it may have caused numerous fatalities. Neil deGrasse Tyson hinted that humanity was rather lucky that the recent Russian fireball exploded about 20 miles up in the atmosphere, as its energy content was about 30 times larger than the Hiroshima explosion. It should be noted that the potential negative outcome from smaller impactors increases in concert with an increasing human population. 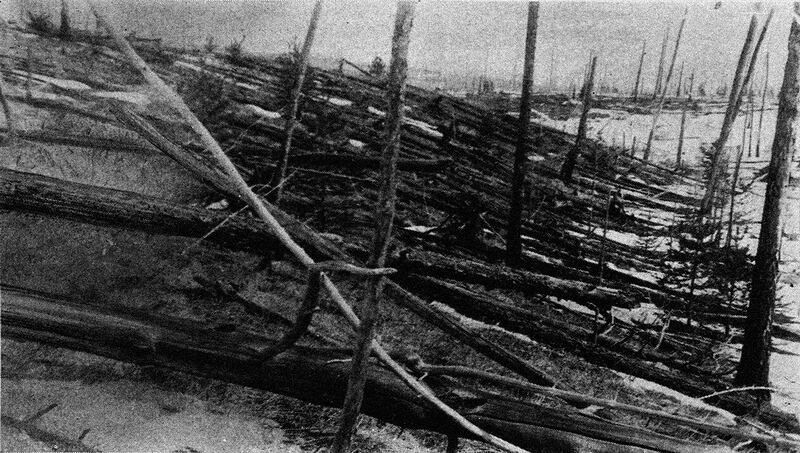 In 1908 the Tunguska impactor toppled millions of trees in a rather remote part of Siberia (image credit: Kulik). Had the object exploded over a city, the effects may have been catastrophic. So how often do large bodies strike Earth, and is the next catastrophic impactor eminent? Do such events happen on a periodic basis? Scientists have been debating those questions and no consensus has emerged. Certain researchers advocate that large impactors (leaving craters greater than 35 km) strike Earth with a period of approximately 26-35 million years. The putative periodicity (i.e., the Shiva hypothesis) is often linked to the Sun’s vertical oscillations through the plane of the Milky Way as it revolves around the Galaxy, although that scenario is likewise debated (as is many of the assertions put forth in this article). The Sun’s motion through the denser part of the Galactic plane is believed to trigger a comet shower from the Oort Cloud. The Oort Cloud is theorized to be a halo of loosely-bound comets that encompasses the periphery of the Solar System. Essentially, there exists a main belt of asteroids between Mars and Jupiter, a belt of comets and icy bodies located beyond Neptune called the Kuiper belt, and then the Oort Cloud. A lower-mass companion to the Sun was likewise considered as a perturbing source of Oort Cloud comets (“The Nemesis Affair” by D. Raup). A halo of comets designated the Oort Cloud is theorized to encircle the periphery of the Solar System, and reputedly acts as a reservoir for objects that may become terrestrial impactors (image credit: NASA/JPL). The aforementioned theory pertains principally to periodic comets showers, however, what mechanism can explain how asteroids exit their otherwise benign orbits in the belt and enter the inner solar system as Earth-crossers? One potential (stochastic) scenario is that asteroids are ejected from the belt via interactions with the planets through orbital resonances. Evidence for that scenario is present in the image below, which shows that regions in the belt coincident with certain resonances are nearly depleted of asteroids. A similar trend is seen in the distribution of icy bodies in the Kuiper belt, where Neptune (rather than say Mars or Jupiter) may be the principal scattering body. Note that even asteroids/comets not initially near a resonance can migrate into one by various means (e.g., the Yarkovsky effect). 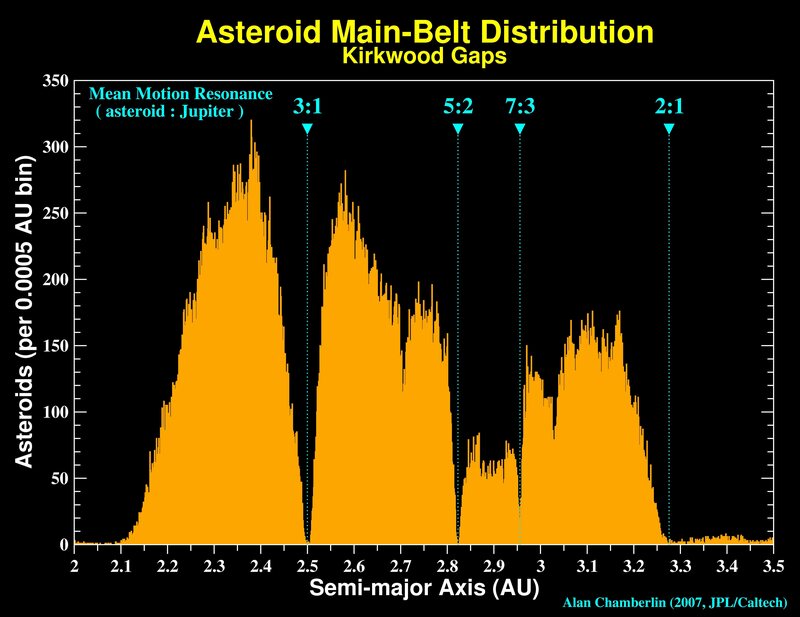 Indeed, if an asteroid in the belt were to breakup (e.g., collision) near a resonance, it would send numerous projectiles streaming into the inner solar system. That may help partly explain the potential presence of asteroid showers (e.g., the Boltysh and Chicxulub craters both date to near 65 million years ago). In 2007, a team argued that the asteroid which helped end the reign of the Dinosaurs 65 million years ago entered an Earth-crossing orbit via resonances. Furthermore, they noted that asteroid 298 Baptistina is a fragment of that Dinosaur exterminator, and it can be viewed in the present orbiting ~2 AU from the Sun. The team’s specific assertions are being debated, however perhaps more importantly: the underlying transport mechanism that delivers asteroids from the belt into Earth-crossing orbits appears well-supported by the evidence. A histogram featuring the number of asteroids as a function of their average distance from the Sun. Regions depleted of asteroids are often coincident with orbital resonances, the latter being a mechanism by which objects in the belt can be scattered into enter Earth-crossing orbits (image credit: Alan Chamberlain, JPL/Caltech). Thus it appears that the terrestrial impact record may be tied to periodic and random phenomena, and comet/asteroid showers can stem from both. However, reconstructing that terrestrial impact record is rather difficult as Earth is geologically active (by comparison to the present Moon where craters from the past are typically well preserved). Thus smaller and older impactors are undersampled. The impact record is also incomplete since a sizable fraction of impactors strike the ocean. Nevertheless, an estimated frequency curve for terrestrial impacts as deduced by Rampino and Haggerty 1996 is reproduced below. Note that there is considerable uncertainty in such determinations, and the y-axis in the figure highlights the “Typical Impact Interval”. Estimated frequency of impactors as a function of diameter, energy yield, and typical impact interval. Results assume an impact speed of 20 km/s and density of 3 g/cm^3 (image credit: Fig. 2 from Rampino and Haggerty 1996, NASA ADS/Springer). In sum, as noted by Eugene Shoemaker, large objects do indeed fall out of the sky and cause damage. It is unclear when in the near or distant future humanity will be forced to rise to the challenge and counter an incoming larger impactor, or again deal with the consequences of a smaller impactor that went undetected and caused human injuries (the estimated probabilities aren’t reassuring given their uncertainty and what’s in jeopardy). Humanity’s technological progress and scientific research must continue unabated (and even accelerated), thereby affording us the tools to better tackle the described situation when it arises. Is discussion of this topic fear mongering and alarmist in nature? The answer should be obvious given the fireball explosion that happened recently over the Ural mountains, the Tunguska event, and past impactors. Given the stakes excessive vigilance is warranted. Fareed Zakharia’s discussion with Neil deGrasse Tyson is below. The interested reader desiring additional information will find the following pertinent: the Earth Impact Database, Hildebrand 1993, Rampino and Haggerty 1996, Stothers et al. 2006, Glimsdal et al. 2007, Bottke et al. 2007, Jetsu 2011, G. Keller’s discussion concerning the end of the Dinosaurs, “T. rex and the Crater of Doom” by W. Alvarez, “The Nemesis Affair” by D. Raup, “Collision Earth! The Threat from Outer Space” by P. Grego. **Note that there is a diverse spectrum of opinions on nearly all the topics discussed here, and our understanding is constantly evolving. There is much research to be done. Given the stakes, vigilance is warranted. We should better understand the odds and consequences of potential impacts of various sizes, and our ability to manage the risks with technology so we can reasonably decide what’s due vigilance and what’s excessive. Hi William, “We should better understand the odds and consequences of potential impacts of various sizes”, I agree. It is rather difficult to simulate the effects of an impactor, and various models yield differing results. I think continued research to increase the terrestrial impact record is needed, in addition to better studies of Earth’s known impact craters (e.g., deep drilled samples). We should be building a fleet of immensely powerful heavily armed defensive spacecraft. Not just for the comet/asteroid threat, but for that of an aggressive alien civilization. We simply don’t know what’s out there. For all we know, an armada of ships is already massing on the other side of the sun, lying in wait, perfectly hidden. When we do finally see them approaching, good luck getting a defense plan in place in time. The best we could muster would be refurbishing and old shuttle with a battery of thermonuclear devices in its cargo bay. The astronauts would manually target the missiles before attempting a rapid reentry to avoid the barrage return fire. They would also carry sidearms should the shuttle be boarded. Brilliant! Speaking of sidearms, please assure me you don’t own any. 😀 Isn’t it obvious this was a joke? Guess not! Great Theory, but one flaw: That won’t stop the Flying Spaghetti Monster. Your thinking is exactly why I’m glad that solar systems are so far apart and there’s no intelligent life on other planets in this system. If a civilization that could reach another solar system already exists (and they probably do give 13.7 billion years) then they also could easily destroy us if they chose in any number of ways. Movies are impossibly optimistic. Even though we are the underdog we will always prevail. But there is a flaw in this. A civilization that would be so advanced to cross over such huge interstellar distances would be much, much more advanced than us. An earthly example would be a dogfight between our current fighter planes and the ones from World War 2. The latter would face impossible odds to win. And that isn’t even 100 years of evolution. So, in reality if another star traveling civilization would want to destroy us, we would be completely hopeless. Being picky – the Golden Gate Bridge would not still be intact in that picture. The far tower may still be up but the bridge deck should already be snapped. Much more important than just the tsunami is the heat and debris thrown up by the impact, that’s the aspect that would cause the most immediate problems. (imagine all that splattering mass being ejected and crashing down again all over the earth.) Also the dust thrown into the upper atmosphere has been calculated to block out the sun for many years… no sun, no crops, no food. That’s the main reason there was the global die-off… not because the critters were crushed/vaporized/drowned and broiled… they starved. Hi Paul, concerning the flaming debris, you may be interested in watching Cathy Plasko’s (Los Alamos) simulations of that aspect, at the following: http://www.youtube.com/watch?v=_tASkST5A9A (scroll to 33:15). The reasoning of the average human can be painfully warped. Just 20 minutes ago North Korea made national headlines in the U.S. for making yet another idle threat of a nuclear attack on the U.S. Of course North Korea has no such capability and the U.S. has a multitude of ways of neutralizing any such threat should they finally acquire the necessary rocket technology. Yet a much larger explosion now has occurred twice over Russian soil in the last 110 years and there have been numerous close shaves over that time span with much larger space rocks and no government seems motivated enough to worry about that problem and take serious preventitive action. I don’t think any scientist with a rational head on their shoulders would have denied that impacts with space rocks big enough to do damage should be relatively common in modern times. Are these the same people that believed that planets around other stars weren’t common before 1990, despite numerous strains of evidence from other areas of science that they should be? The same ones that think that if they don’t see something themselves that it can not possibly exist despite reams of indirect evidence? If so they should have their degrees revoked by their universities. At least with the last incident in Russia there is talk of at least looking for potential smaller sized threats. I guess cities and states are worth saving after all. Hopefully Mars getting buzzed by a comet will wake the governments up to the very significant (long-term) threat of comet impactors as well. So, you’re saying if a scientist is initially wrong, his/her degree should be revoked? Screw Scientific Method, THIS GUY has it all figured out! And here I was, thinking the budget was impeding progress. But thanks to Greg, I now know it’s because the government hates cities and states. I’m an astronomer, and I can’t say I know of any astronomer who claimed that planets were uncommon. That is a ridiculous assertion. Astronomers simply said they didn’t know the answer to that question. Not only that, but that nobody knew the answer to that question… so if anyone claimed they did, perhaps via your weak “other lines of evidence,” then it was perfectly reasonable to cry foul. That is not the same thing as claiming planets are uncommon! Similarly, nobody I know of “denied that impacts with space rocks big enough to do damage should be relatively common in modern times.” But they did ask the perfectly reasonable question, “If they do pose a common threat why haven’t we seen more than one in the last several hundred years?” Again, this is perfectly reasonable. More importantly, in the meantime many scientists have set out to better understand the situation by studying historic events, impact craters, missile defense data, surveying the solar system, etc. If people are now coming to the realization that there is a potential threat from smaller asteroids it is due in part to the event in Russia, but just as much due to the background of work by these scientists that puts this event into context. I’m sorry to say that I find your axiom to be rather useless in practice. It is a good starting point, but little more. Some people seem to think that a clear rational view of the world comes naturally without effort. It is anything but. In fact, like most everything else, to get to the truth requires a great deal of work and effort. You should be thankful that there are people out there willing to do that work, and support them. Hi Greg, I’m unsure if you were an astronomer during the 90s (I was not), but I recall reading somewhere that Geoff Marcy had difficulty getting his planet hunting proposals accepted, and similarly Bill Borucki with Kepler. I also recall reading that one of the two referees of the famed Mayor & Queloz 1995 study rejected the paper (http://adsabs.harvard.edu/abs/1995Natur.378..355M), but the objection was overruled by the editor. However, was the resistance because folks didn’t think planets were common, or rather because they didn’t believe the aforementioned astronomers could detect them via their proposals. It was my understanding that the resistance stemmed from a mix of both. Hi Greg; I was an astronomer during the 90’s. The issue was, as always, the best use of resources. It is risky to fund a project that appears to have little chance of success for technical reasons. In fact, detecting exoplanets was one of the prime goals of astronomy during that period, so there is little doubt that the goal was deemed worthwhile… but there are always squabbles over the allocation of resources. An unfortunate example of this sort of thing is the whining Halton Arp did when his extremely flawed approach to observational cosmology was met with resistance. He didn’t want to accept that people thought his science was bad, so he blamed them for having a bias against his cosmology instead. Very sad indeed. Regarding the topic of small asteroids, as is usually the case when you look at things in detail, it becomes rather complicated. A small asteroid has to explode or impact at the location of a large city to cause substantial damage. Two thirds of the planet is covered by water… much of the landmass is relatively uninhabited. If the incidence is once per century then the odds of a major catastrophe in the next 50 years are very small. An asteroid the size of the one in question is only presently observable when near the earth because it is so small. We hope to catch these as the whiz on by and then use the small number of observations we were able to make to predict the next time it will approach the earth. Then we observe it again. By that time we can predict the odds that it will hit the earth at a future approach. But what if it hits the first time? Or if we miss the pass near the earth because, as in this case, it approached from the sun where it is difficult to detect? If we are going to get serious about these small asteroids then we need a space-based approach that will require a much higher level of funding than we have now. If the odds are small that there is significant danger in the next 50 years, then what’s the hurry? Meanwhile… there is a comet heading toward Mars right now. It may not impact, but if it does the energy released will be beyond the imagination of nuclear weapons designers! I am much more concerned about a comet impact with the earth. Even though the probability seems small, it is possible that such an impact could end our civilization. Unlike a large asteroid, we would not have enough warning to do much about it! As an ancient wise King said, “There is nothing new under the sun.” – Human nature, one of the universal constants. Concepts and notions hard-dried into rigid concrete blocks. Takes the occasional hammer blow to free up new thoughts. Hi GregtheThird, I’m in agreement with what you stated at the outset regarding the hope that the incident in Russia helps inform the general public. I think many scientists are concerned with issue, as indicated by the various detection surveys being initiated. Examples of the latter are PAN-STARRS or NEOSSat, http://www.universetoday.com/100187/satellite-swarm-readies-for-spaceflight/ . There are a number of good books which discuss the hesitation by some scientists to counter, for example, the hypothesis that the dinosaurs were wiped out by an impactor. In the Hildebrand 1993 reference posted above, http://adsabs.harvard.edu/abs/1993JRASC..87…77H , there are a few references within that discuss what evidence supported the opposing view. Also, you may likewise be interested in G. Keller’s site concerning the debate: http://geoweb.princeton.edu/people/keller/chicxulub.html . Thanks for the courteous comment. I as using a bit of hyperbole in my post. I am aware of the detection efforts for large asteroids and certainly this has been a significant relief and step forward, but much more needs to be done and much of it is within the capacity of large governments. It looks like the next step will be to look for smaller asteroids that can take out a city or state. The last 2 steps that should also be moved foward with appropriate funding would be the beginnings of an early detection system for comets and of course infrastructure for diverting asteroids and comets. To my knowledge there is a grand total of zero resources allocated towards diverting something after we find it. Hopefully governments will begin to realize that it is their cities that they may one day save. I would think Russia would be particularly motivated right now to leap forward. Space rocks could be a possible explanation for rogue waves, those of which that are witnessed of course. They have happend in the open ocean on clear days opposing the direction of prevailing waves and can be 70 to 100 feet in hieght. Rogue waves are said to be too numerous to fit into random modeling. I don’t think they are created without some cause; adding to the evidence of under reported impacts. Hi Tim, interesting. I wonder if there has ever been any direct links of a rogue wave tied to a meteor impactor, whereby someone saw a fireball and then witnessed the wave? On an armament-bristling planet, high-wired with all kinds of regional and global surveillance coverage, under nuclear proliferation shadow, would not a body large enough to generate a rogue wave, somehow appear a blip on someone’s “radar screen”? Perhaps not. Fascinating possibility! Humans would rather fight for power and possessions, and let God deal with comets and asteroids. My guess is we won’t have the asteroid-care-tech, until we resolve issues related to world hunger and poverty. I’m less sure of that. It seems like general awareness is growing that asteroids are an existential threat to humanity. Question: What is the Sijil or Saqar? and who is the Anti Christ? ???????? ????? ????????? ????????? ?????????? ?????????? ????????????? ????????? ????????? ???? ???????? ????????? Striking them with stones of baked clay (FROM SIJIL). ???????? ?????????????? ?????????? ???????? ??? ?????? ????? ??????????? ????????? ?????? ?????? (A Torture) from Allah, Lord of the Ways of Ascent. And what will explain to thee what SAQAR is? ????? ???????? ??????? ???????????? ?????????????? ?????? ???????????? ?????? ??? ?????????? ??????? ????????? ????? ?????? ?????????????? And We are not to be defeated (in Our Plan). At its passage, people in Mecca and Yemen would see it in the evening of that day. ???????? ???????? ??? ?????????? ??? ????????? ??????? ?????? ??? ??????????? Do men think that they will be left alone on saying, “We believe”, and that they will not be tested? Gog and Magog are also part of. ????????? ?????? ???????? ?????????????? ????????? ??? ??????????? ??????? ????? ???????? ????????? ??????????? ????? ???? ????? ?????? ?????????? (their barrier), and they swiftly swarm from every hill. so return to what? to the village? or return to life? ???? ????????? ????? ?????? ???????? ?????? ????????? ?????? ?????????? ????? ??????? ??????? ???????? ??????? ?????? ????????? ? ????? ????? ???????????? ?????? ?????? ??????????? he made “Hell” appear and will throw in those who will not follow him. As for extinctions, Wiki has info on Pangea/Gonwanaland saying since 2007 the lithosphere under India was thin; recent info says thinness due to heat under the lithosphere. Paper from co author D Petit says thinness of Pacific sea floor as a result of the Moon creation is reason we have crustal movement and Venus does not. Perhaps a more fruitful line of inquiry would be one directed toward discovering what heats the Earth core and produces the gas blow outs that are civilization’s reset. You are mashing knowns with unknowns from a basis of ignorance. – Yes, the Moon thinning the crust may be responsible for our plate tectonics, Earth is marginal for it. But we are also more massive than Venus and, most importantly geologists think, our greenhouse has not made the water vanish into space. Water lowers the viscosity of the mantle minerals a lot. – The old idea of the Moon emanating from the Pacific is gone since we observed … plate tectonics. The plate movements predicts the large gap/supercontinent assemblages and thin ocean crusts. – About half the Earth core heat flow is from radiactive heating, many years observation of geoneutrinis has established that. The rest is believed to be remnants from the accretion of Earth and its gravitational and chemical sorting. – There is no direct relation between plate tectonics and “gas blowouts” (methane release? ), nor between blowouts and civilization life times (many have dissappeared due to droughts, it seems), nor have the global culture ever been “reset” due to population increase. Aliens could just push a few rocks with the front grill on their spaceships..wipe most of us out. Then take over the planet and make us slaves to their empire..lol..i wonder what kind of food they like..im hoping their vegitarians..
Must you take things so literally? Again I was using hyperbole and attempting to mix in some dark humor. I do find it irritating at times when apparently intelligent professors and post-grads take a stance narrow on a subject using the logic that since something has yet to be observed that it does not exist, especially when there is plenty of indirect evidence that it does. Science is about weighing evidence and not coming to a conclusion until the evidence warrants it. In fact, indirect evidence “weighs” very little. Science has to be conservative by its very nature. You make the claim that, “For a concrete example I can cite that planet naysayers were still in abundance even after pro-planetary discs were discovered around very young stars.” I find this assertion to be rather bizarre. Again, as an astronomer, I must tell you that you have been misinformed. This statement simply isn’t true. Most astronomers assumed there were planets around other stars. But unlike most non-scientists, we are able to remain undecided until enough facts are in to truly decide the issue. In fact, I recall wondering for decades if other planets existed, how common they were, and how typical our solar system is. Sure, some people hypothesized that planets were rare based on the small amount of evidence available. Others took the opposite stance. But we all knew that none of us really knew the answer! That’s the part you seem to be missing. The fact that some people approached a solution by starting with the hypothesis that planets are rare can be mistaken for “believing” that planets are rare. I believe it irritates you because you see things in black and white terms. Reality is never that simple. In fact, not accepting an assertion that is based on less than compelling evidence is a good thing. What irritates me are people who hold onto to misconceptions even when presented with evidence that refutes their belief. My challenge to you is to not fall into that trap. ~ A recent news item suggests a big, newly arriving Comet of substantial mass(?) COULD hit Mars – and put out the lights on man’s search for life there, depending on possible orbital alteration from cometary outburst. That would be a fearful “wake-up” call indeed: “Big comet slams into terrestrial planet, plunging it into global cataclysm” – knocking out, or destroying, all mankind’s robotic emissaries. A 23,000 mile near passage to a terrestrial planet by heavy potential impactor, in itself, is enough to prompt serious thought. It’s one thing to watch, mesmerized, a series of impact-explosions from stream of broken fragments, pummeling a huge Gas Giant world of alien condition. That was fearful enough, in an exciting sort of way! Quite another, to witness the horror of a single mighty blow taking-down an “Earth-like” planet (plunging it into a Martian impact-winter?)! And that, right in the local neighborhood! I shudder at the thought. ~ Whether “identified” terrestrial craters are from impact events or not, who can deny Earth suffered the same fate as ALL the other bodies of the Solar System, where plastic surfaces still attest the violent storm that engulfed the Sun-family of worlds. In fact, it is very strange (even taking into account geology and erosive forces of air and sea), that Terra does not more resemble all other cratered terrains of Sol’s Star System – including its companion Moon! ~ A familiar theme once again dramatically emerges (now showing unsettling signs of being somehow demonstrated): Catastrophe. The gradualist worldview, may be staring into its grave, for burial overdue. ~ It is admirably refreshing, and praise-worthy, to read a report that does not state everything believed as if it is incised in stone! How rare! – Theories appear in first light, hypotheses fade-away with turn of night, but evidence rises to enlighten man’s sight (if objective enough to see). Complements on sharply presented, well written piece, beautifully illustrated, and richly linked (next week, may be plumbing the depths). A template for more, should be. It was engrossing, and a pleasure to read! I agree, it was very well said. As you know, lately, over the last 12 months or so. There have been many sightings of comets/asteroids passing by our Eden w/some air bursts. Unlike most planets w/no atmosphere, our Eden is affected 10-X’s more w/more scenario’s. As your well aware of, our atmosphere is key in blocking the in-coming rocks w/air burst types. But when they actually hit our solid Eden, our atmosphere spreads the particles of smoke, dust, and other material’s like a blanket. Are you a bit fearful we have been seeing many lately? I mean, the law of averages do not lie. What do you say? Take care :-)… . “Every day billions of meteoroids impact and disintegrate in the Earth’s atmosphere. Current estimates for this global meteor flux vary from 20,000-300,000 tons per year and estimates for the average velocity range between 14 km/s to 55 km/s, depending on sizes, masses and composition distributions. These particles arrive both during intense showers and as a nearly constant rain of sporadic meteors.” …. – Wonder if there is connection to “Sprites” and “Jets” of the upper atmosphere, associated with thunderstorms. ~ “Are you a bit fearful we have been seeing many lately? I mean, the law of averages do not lie.” ~~~ The Chelyabinsk event was sobering, needless to say. But in context of the greater World picture ( the Atmosphere, Geology, and other things… ), and of late, local Solar System activity, a sudden up-tick(?) of visitations and flybys, f.e., it does lead one to wonder – especially in light of the Sun’s unexpected behavior. In the panoramic view, its sobering. If the incoming Comet should “thrust” into Mars, with potential consequences Mr. Plait reportedly described, that would be a “fearful” event ( but not for reason you might suppose. …. )! Appreciated post. Best Regards, JRC. Thanks Priz’m. Your honest reply is refreshing. I work w/Old Man Sol w/PM’s=Preventive Maintenance w/Sat-Com’s… Sol’s constant bombardment of solar wind vs Sats & Sat-Coms keeps us all bizzee. here. Parden my abbrev’s please. I do this at work constantly. It is faster. Don’t mind Tor=Torbjorn Larrson.. He is sort of like a fly. He buzzes around knowing how aggravating he can be w/his opposite assumptions on many subjects. It takes all kinds. He keeps people hereon their toes..
~ if you work in light of Sol, and Sun’s activity traces the extraordinary, you are in one place to know. ~ Personal anecdote adds dimension, brings event closer to intimate home. (40 miles away!?) The meteor’s trail of thunder, and burst of light – over populated community (not remote forest, or distant sea) shattered more than distant windows. It also, as you discern, sent a mild shock-wave of another kind, “heard” around the world – one for modern man to ponder. Again, if an icy stranger from the celestial deep, should put man’s Science on Mars to deathly sleep, in planet rent, serious message could Earth therein receive. In global frame, very somber in its electronic-silence – and shroud, from terrestrial world set-aflame! Takes all kinds to make the world go round. In you, I can see & feel your wanting to continue in type like a poet flowing his words with ease. You remind me of one Jim Morrison of “the Doors”. You must of heard of the good ole boy. (that is one great compliment to you my friend). I myself lack the typing skills, words, or patients. To each his/her own I always say. It comes down to the individual person the importance of each subject matter. For me, it is Ole Man Sol. He has big, small & in between brothers out there by the trillions to the 10th power+. He cannot go super nova’s but he will blossom into a red warrior giant, then relax to look the size of our Eden Earth looking almost white as snow. ……….Hey, I tried…lol. God Bless & keep the faith. ……:-)… . You see, Me (no, not me), there is a poet in every heart, if only awakened by a spark. Read Poets of old, and when moved, a rhyme or 20, may spring from your soul. – There is something wonderful and glorious about the stars, near and far. And though “average”, the incomparable Sun, ever a marvel to behold, Earth’s home-warming Star! In light of work, your future is bright. Good success, under Sun of day, and stars of night. Well said as usual Priz’m. A rhyme or 20…lol. When I read that my mind went automatically to today’s joke in music. “RAP” & Hip-Hop”! I am now going to have you go into minds eye in visual & hearing mode. My left hand & right flying up into the air w/both middle fingers standing to attention & saying, RAP this one & hip-hop on that one”! Sorry for my rather uncouth mind bending scenario. But such as life. I can read your posts all day long. An art form many do not have, heavily including myself. Murdin I have heard of & read some of his writings not too long ago. I am a Tesla kind of man myself. If only he was here today. You have a great day Priz’m, hope to see you post more here. And God Speed also. PEACE! Priz’m..My last reply was explaining RAP/Hip-Hop & my visual bombardment w/ my gestures. I hope you know it was just a joke of sorts. Near my home/city in Massachusetts, they arrested a group of 17 to 22 yr old’s for apparel ware way below their hips, & listening to loud vulgar RAP/Hip-Hop. I was amazed my jokingly reply to you actually got real factual attention. Funny how things said pops up somewhere in society. Frankly, did not really understand first part of your previous reply. Personally, I intensely dislike the militant drum-beat forms of “music” you mention (“vulgar” is aptly descriptive), sprinkled about with offensive lyrics (appalling in underlying themes), too often overheard against my will. I cringe to think what marshal-toned messages are daily programed into susceptible young minds – yearly drilled into the youth of our land. Best I say no more. …. One could almost imagine, that the eruptive disturbances here below, are being reflected back to us from the heavens above. In near Solar Space, we could be in for “exciting”, uncertain times. If things do heat-up, increased celestial turbulence might have cause traceable to, and found right here – on Planet Earth. As you advise, “stay tuned”. You should be a speaker & making this world a better place. And yes, I knew you would dislike “RAP/Hip-Hop”. I detest it as you are well aware of. Well, I figured you might not get what I was trying to convey in the first part of my post to you. But you acclimated yourself brilliantly to the rest. Ole Man Sol is starting to stir. Stay tuned is applicable as you agreed w/me. Take care. I would not consider the Russian event “a wake up call”. We know impactors happen, to take an example out of a statistical distribution and pretend it is extra informative is frankly dumb. Perhaps, Mr. Larsson. It would be interesting to know what the consensus is among the general public (especially the Russian public), and the scientific community. – The Chixculub impactor is the current consensus prediction, such as it is, for the K-Pg extinction. I don’t have my references handy from where I sit, but there is a recent large review with some 50 names on it. And better dating after that has definitely clarified the datings. Keller’s hypotheses are, as I understand it, not well seen. – The Chixculub impactor is the only impactor unambigiously tied to an extinction. – Hypotheses of periodicity in the extinction or diversity record are not found in recent analyses, where the sparse record has been improved and proper autocorrelation methods have been used. The Shiva and Nemesis hypotheses are not well seen, I think. Even if the, again sparse and badly sampled, crater record itself would have the suggested 30 million year periodicity for large impactors, considering that a human species becomes ~ 1-2 million year old on average, the “inevitable” dangerous impactor has less than 1/10 risk to happen to us specifically. We should work to alleviate potential harm, but from a basis of knowledge, not hype. Most Central America and All Caribbean countries, including Cuba, are obliterated in the present day simulation, but they only care about “several US states would go missing”. Typical North American observation.